In this review we explain why you should stay away from EliTrade, the binary options robot. EliTrade is an automated software for binary options. It will generate trading signals and execute them on your account. EliTrade will give you $500 for you to start with this robot. The robot is free for the first two weeks and you allegedly can keep all the money this robot will make you with this free deposit. Isn’t that weird? Let’s start with some basics. 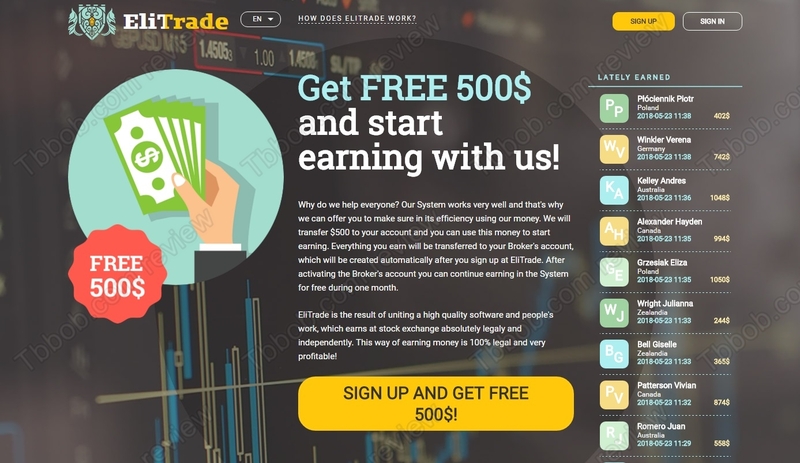 The story they want you to believe is that they created a profitable binary options robot and instead of selling it right away they will give you free access and $500 on top of it. Really? Of course not. The $500 they will put on your account are virtual, it is not real money. We tested the software and it obviously is a piece of scam. It opens trades, but it doesn’t tell the opening time nor the direction (call or put), check our picture. So, it very easily fakes the results to make you believe that it is profitable, but it for sure is not. One major problem is that EliTrade is an anonymous service, therefore illegal. A trading robot is a product of investment advice, which needs to be licensed by a regulator. Yet, EliTrade does not provide any contact information, let alone a licence number or anything like that. So, it is an illegal service. The second major problem is that EliTrade will push you to deposit money with Utrader, which is a broker that is not regulated. So, only shady entities that is very easy to lose your money with. It’s clear is that the main aim of EliTrade is the same as with almost all other scams we have reviewed so far. It will push you to deposit with a selected broker (Utrader), because people who run this robot are paid by this broker for referring new depositors. This is how they make money. All the money they claim to give you is not withdrawable, you will have to deposit your own money and you won’t be able to get anything back. EliTrade is not regulated, it is a shady robot that will very probably lose your money. Stay away from it! If you want to make money with binary options, you will have to build your own profitable strategy. You can try and do that on a free demo with a regulated broker. Be sure to understand that in trading you can make, but also lose money.